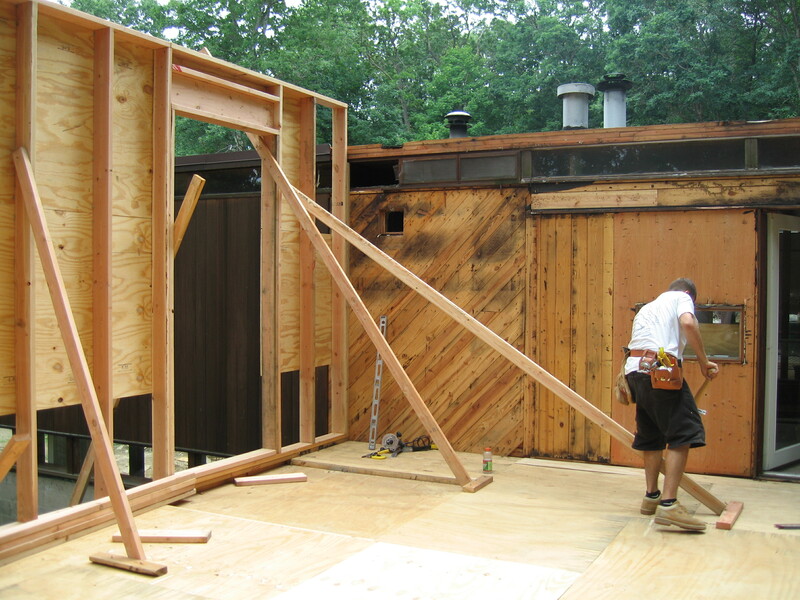 Carpenter working on a combined renovation and addition to a Deck House in Pound Ridge, NY. Setting the outer walls. Doctor Structure / Third Floor Corporation is a full service construction and general contracting company serving private residential clients in New York State’s Hudson Valley, Putnam and Westchester counties, Connecticut Statewide South County Rhode Island and Manhattan. We specialize in structural repairs of all types, custom crafted homebuilding, the construction and repair of specialty kit houses such as Deck Houses, and Noble Homes, estate development, architectural projects and in the restoration of historic and classic residential architecture.